After the Boston Bruins won their first Stanley Cup in 39 years, making Boston the definitive titletown of the country (on the heels of the Sox, Pats and Celtics) you knew there was going to be a party. What you didnâ€™t know was that there was going to be a receipt. On the 18th of the month, right after the duck boat parade through the streets of beantown, the team hit Connecticutâ€™s own Foxwoods Casino for a night of debauchery. The result? 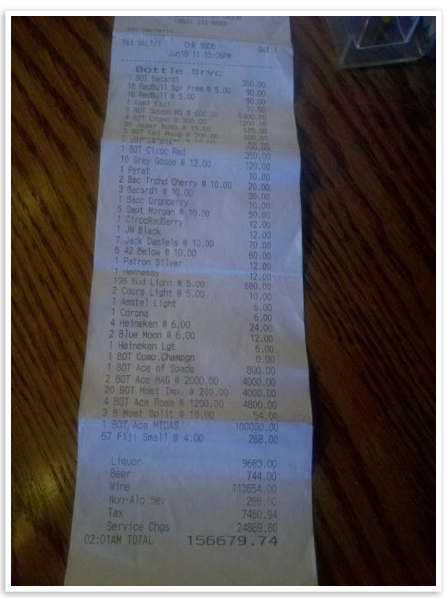 How about a bar tab of $156,679 (tip included, to the tune of $25k)? One thing to realize here is that they didnâ€™t throw a party for all of downtown â€“ this was just for the team. With 26 guys on the roster, that comes to about $6k a headâ€¦ but after 39 years, well worth it. Do you see anything on the receipt worth calling out? H/t to The Tony Kornheiser Show for the tip and Busted Coverage for the pic. JT – I’m *shocked* that you have found a way to mention the Bruins Stanley Cup win in your latest post. Foxwoods only comped ONE bottle of champagne! Bruins and specifically, Tim Thomas, are denying this was their bill. Thomas said that people thinking this is real is embarrassing and they don’t like the picture it paints of them. As with everything, there’s most likely a bit of truth in both versions of this story.